If you are a senior enjoying a full and independent life at home, a fall or slip can be a real setback. After a stay in hospital, returning home can seem a little daunting, particularly if you are still recovering and have limited mobility. 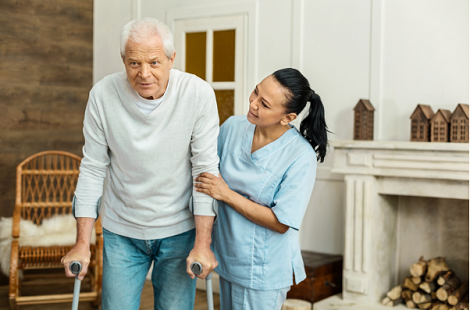 You may not be ready or have a need for the full-time support of a residential aged care facility, but you may just need a little help to get back on your feet – this is where respite care can be of assistance. Respite care in NSW offers elderly people a range of services, from in-house Community Care, through to a short stay in an aged care facility. The focus of these services is on wellness and reablement – assisting the individual to return to their routine and retain their independence. Even for those who currently have a carer, respite care allows these friends or family members to have a break to recharge their batteries and take a little time for themselves. So how does respite care work, who is eligible and what type of services does respite care cover? Community Care offers elderly individuals the option of remaining in their home for their recuperation after an accident, whilst benefiting from a little outside help. The first two weeks are often the most significant period for healing, and this is usually when mobility and stability are most compromised. During this time, it can be of great comfort to be visited by a helper who can provide support with a number of physical tasks. Assistance with personal care such as washing, dressing or even shaving. Running errands, shopping and paying bills. Help with household chores such as meal preparation or laundering clothes. Transportation to appointments or services such as doctors, physiotherapists, or to the chemist to fill a prescription. Alternatively, if a higher level of care is required, residential respite care may be the solution. There are a range of aged care residences located throughout NSW with facilities and amenities to get you back on your feet faster. Visiting specialists and onsite medical staff. If you are currently in hospital, a family member, social worker or doctor may be able to assist in contacting Regional Assessment Service (RAS) for a full assessment for eligibility for home-based respite using a Community Care program. For higher levels of care, people who have been assessed as eligible by ACAT are able to receive residential respite services for up to 63 days per financial year. If a third-party such as a family member, wish to organise these assessments on their loved one’s behalf, the verbal consent of the patient to act as their representative may be required. This ensures the patient understands what is happening and protects their rights. Fees for respite care are means-tested and can be government subsidised. This ensures that everyone receives the appropriate care no matter what their current financial situation. If you feel respite care may be right for you or a loved one visit MyAgedCare.gov.au or call them on 1800 200 422 to discuss available options. After a phone discussion, they can then arrange an assessment for eligibility for respite care services based on your current requirements.